The center of the rear tire was pretty worn out so today's priority was tire shopping. I first tried a small shop Brad recommended in Philometh but they didn't have anything the right size. The owner was interesting to talk to though. He thought it was really odd that I had the K60's on a touring bike but once he saw that I was from Alaska, it made more sense. He begrudgingly recommended another shop and drew a nice map. I probably should've called ahead as they can order almost anything and have it here in a day or so. But I found something that'll work at the local Honda dealer. The "correct" tire size for my bike is 4.00-18 but inch size tires are getting harder and harder to find. They had a 110/90-18 which is about the same size and definitely closer than the 110/80-18 I had on earlier. 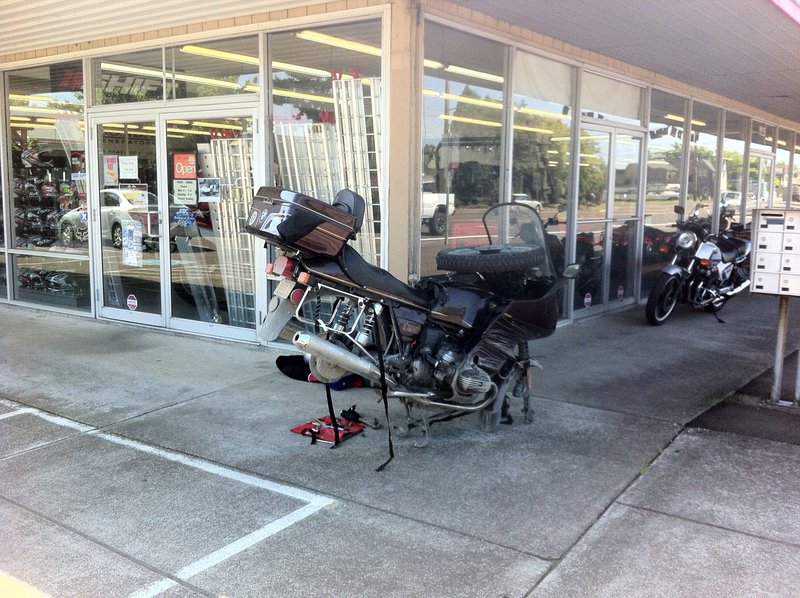 The dealer let me disassemble the bike in the shade in front of the store and pulling the rear wheel took about 15 minutes using only the built in tool kit. Pulling the front wheel is definitely the easiest way to get the rear wheel off. The front wheel is sitting on the handle bars to weigh down the front end of the bike as the top case adds just enough weight to bias it towards the rear. In only about 30 minutes, they had the new tire mounted and balanced and even gave me some grease for the spline and the axle and some shop towels. 15 minutes later, it was all back together without the benefit of a torque wrench, just my calibrated arm. I expect it to be just fine and will recheck all of the bolts later on in the trip. No leftover parts so that's a good start. All in all, a great experience at the Honda dealer. Even though they were busy, they squeezed in my tire mount and balance and didn't charge me a fortune. Update - Picked up some di-electric grease and put a dab on the fuse contacts, the bulbs bases and since I had it apart, the headlight terminals. None of them showed any significant corrosion. 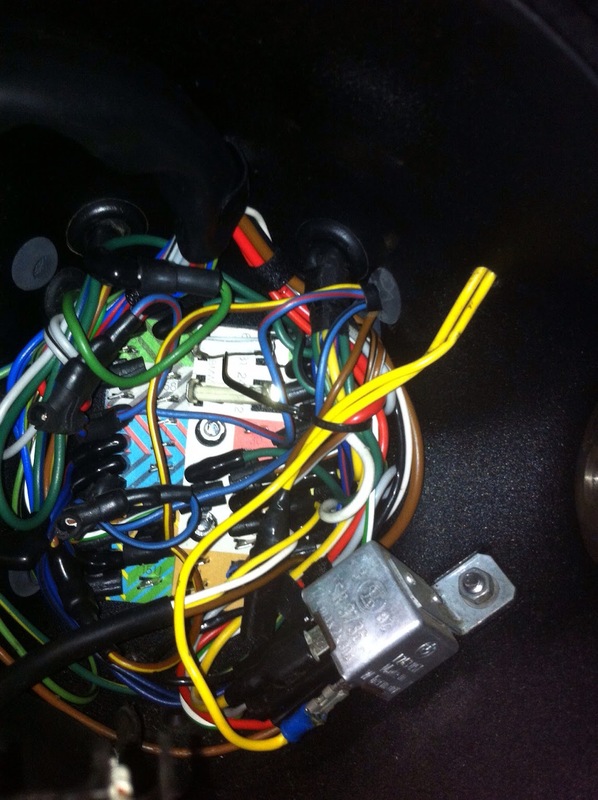 The connector at the back of the analog voltmeter are too difficult to reach without drilling out rivets. I'll pass on them for now. This is the inside of the headlight shell. Even with all the extra room in the fairing, the factory didn't use the extra space. I also picked up a small digital tire pressure gauge, partly to compare with the small mechanical one I brought with me. They matched within a 1 psi. Close enough. The dealer has the rear tire pressure set to 36 psi, I'll leave it there for a while and see if it makes a difference. I read somewhere that newer radials need slightly more pressure than the old bias ply tires. 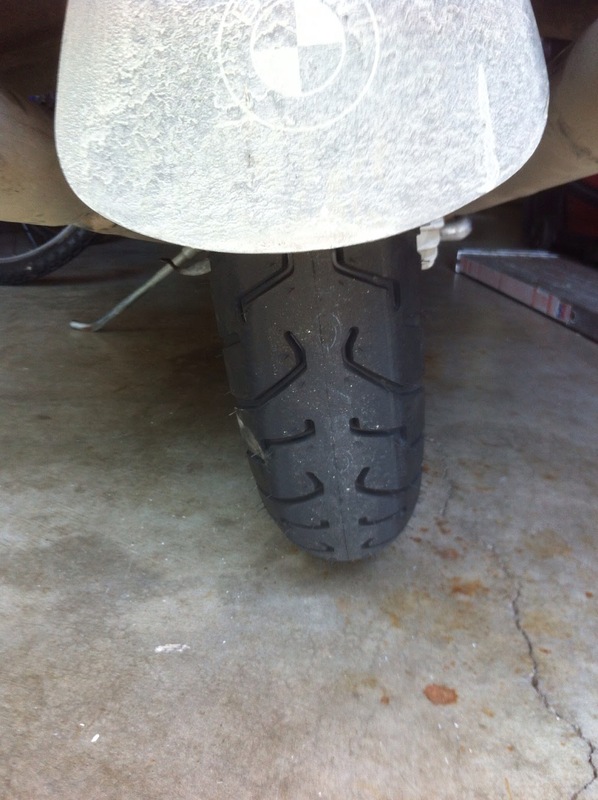 Shinko is a good tire, I run the 705 on my Tiger and love them. I'll be interested to see how your new tire is doing when you get to Baker City. I was afraid Jonas wouldn't have a tire in stock but it was worth a try and meeting him is well worth the visit. Fred's Honda is a great shop too, they don't carry a lot of gear but when you need parts or tires they'll help you out and prices are very reasonable. Glad they hooked you up. That's good to hear as I had never heard of them before. Jonas was interesting to meet and he was happy to see an old airhead still making long trips. Thank you again for your hospitality and help. Good job re the tire change Richard, but then again, it's an airhead so easy to work on for simple chores such as tire changes. I too have faith in your calibrated arm, by if someone you meet along the trip has a torque wrench.....it's a Beemer, not a Ural and tolerances are actually more than just guidelines to the folks in Der Vaterland. I feel better with a new tire as it was wearing pretty fast. I had been running the BMW recommended tire pressure but Brad thought the rear tire looked low. Maybe try a bit higher pressure and see if it makes a difference. I'm glad you installed the new tire. I'm doing the debating dance of trying to stick my tire out until Portland (Maine) or just break down and try to find one now and get it replaced. This is bar far the easiest way to remove the rear wheel. Care must be taken to strap the center stand to the fork to prevent it from folding when the bike is tipped onto the forks. I used the nylon straps I have to ensure the luggage stays on the bike and the lids stay closed. Since I'm only a bit over a third of the way through my trip, it seemed like a good idea. I, too, have heard of Shinko. I hear they wear well. Only negative I've heard is they are hard and not as grippy as some other tires. On air pressure, I've been running a little above the recommended pressure and it seems to have helped the tires last longer. I didn't come up with this on my own. It was recommended by a couple of techs I respect. Maybe it is just my set-up, but thought I'd pass that on. Plus you have the added weight. The Heidenau tires were also supposed to be hard rubber and not very grippy. We'll see how long these last. There are four rear tire pressures listed on the little label under the seat. I was using the one for two up, high speed. 29 psi for the rear tire. But then again, that was for a 4.00-18 bias ply tire. The chip seal that they use in the Yukon and Alaska (and probably many other places) is pretty abrasive but gives great traction. Glad you were able to find a tire. Sometimes finding stuff locally in stock can be hit or miss. Ah, Shinko, the late Raptorman's favorite tire. I can tell you this, he pulled off plenty of moronic antics on cheap tires, say what you will, but they're better than you think. Better than bald, anyway. As the FIL says, runnin' on cords will make you pucker, and I don't think he was talking about getting ready to kiss. Keep it safe out there.